Not only did the citizens of the new United States abandon the church, but in a very real sense, the Church of England did as well. The primary issue being that we had no American Bishops. As you know, a Bishop is required in order to Confirm, ordain clergy, and it takes three Bishops to consecrate a new Bishop. Therefore, if a person wanted to be ordained a priest, they had to make the long and very dangerous trip to England. To remedy the situation there were a few devoted men who took up the cause. Among them: Samuel Seabury, Samuel Provoost, the person we celebrate today, William White, and James Madison – all four of which made the journey to England to be consecrated. It was then, having enough American Bishops, that Thomas Clagget was consecrated Bishop in New York and the Church in America was able to function separately from the Church of England. 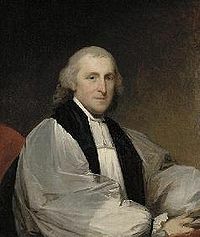 In 1789 – the first General Convention – under the leadership of these men, and specifically William White, the American Episcopal Church was fully organized. William White served as our first and fourth presiding Bishop, serving in 1789 and from 1795 to 1836. In addition he served for 57 years as the rector of St. Peter and of Christ Church in Philadelphia. He died in 1836. In our Gospel reading today Jesus asked St. Peter, “Simon son of John, do you love me more than these?” He said to him, “Yes, Lord; you know that I love you.” Jesus said to him, “Feed my lambs.” This was the restoration of St. Peter after he denied Jesus three times on the night before Jesus was crucified. It is also a command given to all who would be followers of Jesus – “Feed my sheep.” In those three words we are all, lay and ordained, called by God to care for those we encounter. To care for them in both their physical and spiritual needs. For us in the Episcopal Church, William White is an exemplary role model for us to emulate. When you consider what it means to be true and faithful to the Church, you need only consider him to find for yourself the “great pattern of perfection” that leads to becoming a true servant to God and to His One Holy Catholic and Apostolic Church. Previous PostPrevious Sermon: Proper X RCL C – "Neighbors – No Exceptions"